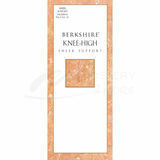 Berkshire Support Hose provide full supprt leg, encourages healthy circulation. These hosiery offer graduated compression where maximum compression is achieved at the ankle and decreases as you move up the leg. This compression when combined with the muscle pump effect of the calf, aids in circulating blood and lymph fluid through the legs. Berkshire Supprt Hose are available in a wide range of colours, styles and sizes making them virtually indistinguishable from regular hosiery. Berkshire Support hose also massages legs during wear time, comfortable control top with more freedom to bend and move.